Volunteer – it does everybody good! Membership Matters. Join us. Together we make better Friends. Consider joining forces with Friends of Bosler Memorial Library by becoming a Friend member. Our collective force is a major financial contributor to the library. Between the funds raised through our used book store, the Bookery, and the memberships received by library supporters like you, we can continue to meet some of the financial needs of the Library. The Friends own and operate the Bookery, a used bookstore located in the Bosler Memorial Library's gorgeous East Wing. The Bookery accepts donations of used books and sells them to the public for excellent prices. The Bookery is open four days a week and is operated solely by volunteers. We feature books by local authors, one of a kind bookbags, bookmarks, and are proud of our friendly & welcoming children's section. We have thousands of books in many different genres--mystery, biographies, crafts, history, romance, young adult, and more. Over the years, the Bookery has provided vital financial support to the library. As one of the biggest donors to Bosler Memorial Library's recent building campaign, Building a Better Bosler, the Friends of Bosler Memorial Library recently made their final payment on a $350,000 pledge in support of the building project. 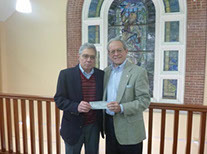 In December 2015, Greg Santoro, former president of the Board of Directors of the Friends of Bosler (left), presented the Friends' final pledge payment check to Bosler Memorial Library Board President Bob Broyles. 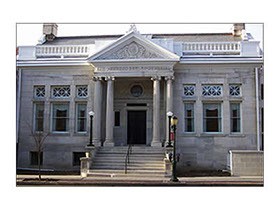 The Friends are committed to supporting the Bosler Memorial Library through its membership contributions, Bookery sales, and fundraising projects. Check the link to see a review of the financial support given to the Bosler Library. The vision of the Friends organization is to “Build a Better Library” bringing the community together, inspiring personal growth, and transforming lives through knowledge and literacy. The mission of the Friends is to support the Bosler Memorial Library through fundraising, promoting public awareness, and volunteerism. The Friends of the Bosler Library, established in 1957, work to promote advocation of the library and its resources and to provide library funding. We are a separate entity from the Library and have our own by-laws and financial reporting and auditing. Your membership in the Friends organization is not the same as your financial donations to the Library’s annual giving campaign. Signup to receive timely, useful information in your inbox.